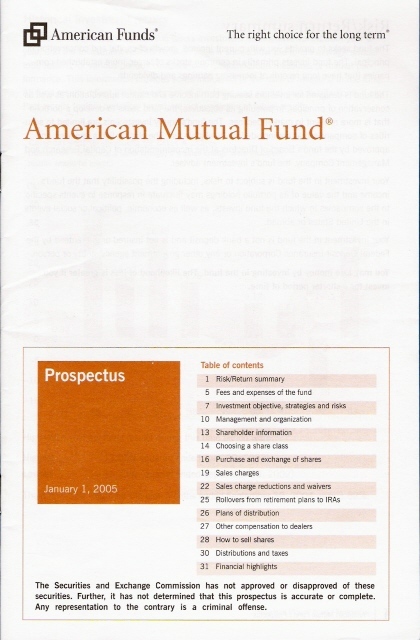 when the mutual fund has a performance history, that history will also be included in the prospectus. performance, such as yield and average annual total return. The fund must send an SAI to any investor who requests it. Information on how to obtain the SAI is usually found on the back cover or last page of the prospectus. On January 26, 2009, the SEC has published a new rule amending Form N-1A, Enhanced Disclosure and New Prospectus Delivery Option for Registered Open-End Management Investment Companies, that will simplify getting basic information from the prospectus. The new rule becomes effective on March 31, 2009. It requires issuers of mutual funds to organize and simplify important investment information, such as investment objectives, risks, expenses, and past performance, that makes comparing the thousands of mutual funds available to the public easier. While this information was present in the current form of prospectuses, it was often placed within different places in the long, legalistic document, making it difficult to find and to interpret. The new format requires a Summary Prospectus that contains the key information in a user-friendly format that will be given to every prospective investor. The Statutory Prospectus, which contains much more information, will be provided on a website controlled by the fund that will provide more detailed information, and that will also be available to any customer that requests it. The Statutory Prospectus will also contain the key information in plain English and in a specific order that will facilitate comparing different funds. If a mutual fund sells more than 1 fund type, then it must present each fund's Summary Prospectus sequentially rather than aggregating the information in a single multiple-fund prospectus. The Statutory Prospectus is required to have both the ticker symbol for the fund, and for any separate classes to make it easier for potential investors to find additional third-party information on the funds. If there are breakpoint discounts, their availability should be alluded to in the Summary Prospectus, with links to find more information on the actual discounts. A fund will be required to disclose its portfolio turnover rate for the most recent fiscal year as a percentage of the average value of its portfolio. This numerical disclosure will be accompanied by a brief explanation of the effect of portfolio turnover on transaction costs and fund performance, and its effects on taxes. The Summary Prospectus should also specify where updated information can be found, especially since the Summary Prospectus is not required to be updated quarterly. The summary section should include the name of each investment adviser and sub-adviser of the fund, followed by the name, title, and length of service of the fund's portfolio managers. Additionally, each ETF that is organized as an open-end investment company will be required to disclose in its prospectus the number of trading days during the most recently completed calendar year and quarters since that year on which the market price of the ETF shares was greater than the fund's NAV and the number of days it was less than the fund's NAV (premium/discount information). Numerous studies have shown that a fund that performed better than the market in the past is just as likely to underperform in the future as it is to outperform the market. This will be particularly true for growth funds and aggressive growth funds, since there is much more uncertainty and risk associated with such stocks, and to maintain such growth, the funds' portfolio will have to be more actively managed, with the concomitant increase of mistakes in selecting stocks and the fees associated with active management. This is why few funds do better than index funds over the long term. Short-term performance could be due more to luck than to investing savvy. Prospectus Finder — Find and download a prospectus for any U.S. fund. Most are in PDF format.